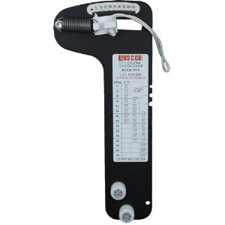 This gauge is designed for setting the proper tension in the standing rigging of sailboats and also for other applications such as supporting cables for radio towers, large tents and other structures. This gauge is relatively inexpensive and is designed to be suitable for rugged marine service. The "Professional Models" provide an increasing durability, accuracy and convenience of use when compared to our popular standard models. This gauge may be hooked on the wire and will remain in position while the tension is adjusted. Manufactured of rugged anodized aluminum, this gauge is corrosive resistant and will give years of service. Detailed operating instructions are included with each tension gauge. The gauge measures tension over a range of approximately 5% to 25% of the breaking strength of the cable and provide an accuracy of + or - 5%. • Use on cable sizes 1/4", 9/32", 5/16", 3/8"